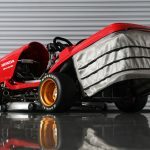 Prior to challenging the current record holder of the world’s fastest lawn mower held by Norwegian Per-Kristian Laundefaret in a modified Viking T6 mower, Honda has brought its 2018 Honda Mean Mower V2 to Goodwood to showoff what it got. 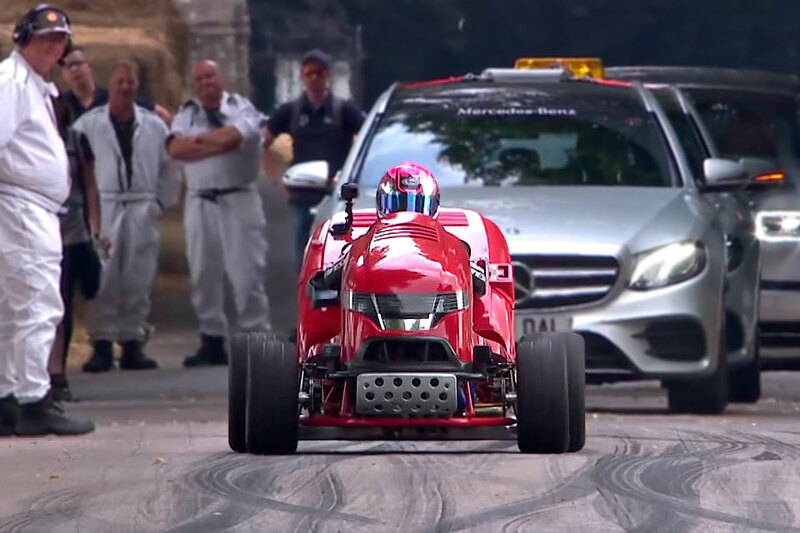 Thanks to the good folks over at Goodwood Road & Racing and the existence of YouTube, we get to see it in action and boy, was it pretty damn surreal. 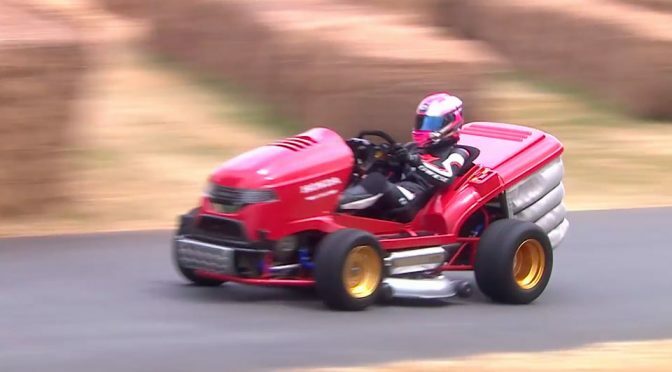 I mean, it is not everyday you see a lawn mower going at speeds, isn’t it? Seriously, you’d forgiven to think it was a go-kart race, except for this thing has ridiculous CG. So, kudos for the brave soul who piloted it at the Goodwood Festival of Speed. And oh, did we mention that it has zero suspension? Wow, that must be one heck of a bumpy ride. 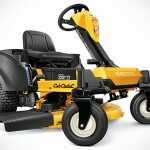 The Honda Mean Mower V2 is a followed up to Honda’s first Mean Mower introduced in back in 2013. The objective is clearly not to sell you a mower that could make insane speed, but more for marketing purpose and gaining back what it lost to the Norwegian. In case you missed it, the V2 is lot meaner than its predecessor. Instead of a 109 HP 1,000cc VTR Firestorm, the V2 is now driven by a 190 HP 999cc motor borrowed from a CBR1000RR SP motorcycle. Motor wasn’t the only thing it borrowed from the Honda sports bike, the clutch, ECU and the 6-speed manual transmission are also ported over. Yup. This thing is sure to go very fast. And yes, the V2 has a cutter deck. It wouldn’t be a mower without a grass-cutting contraption, would it? 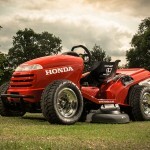 Anywho, hopefully the V2 will have enough grunt to help Honda UK regain its title as the world’s fastest lawn mower. 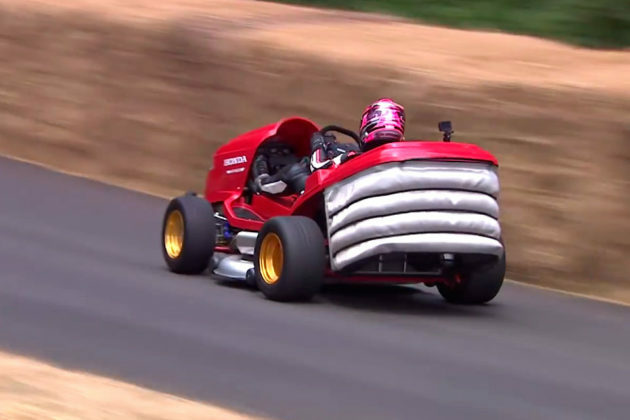 Before that happens, please take your time to enjoy this rather whimsical video of the Honda Mean Mower V2 doing its thing on the track at Goodwood.